2018 was the first full year of implementation of BEAM’s United States Department of Agriculture (USDA) Community Food Project grant awarded back in 2017. This federal grant fully funds our Paths to Wellness program, which focuses in three main areas: prescriptive guidance, preventative education and direct community wellness outreach. Emergency assistance is at the core of what we do at BEAM. By providing basic needs to families who are thrown an unexpected curveball in life, we are able to keep them in their homes. Last year, we helped 856 families achieve just that—relief in knowing their home would not be taken away from them. Mr. John Doe was admitted to a local hospital for a foot wound where he was treated and also diagnosed with diabetes (at nearly 400 pounds). He was referred to BEAM’s Paths to Wellness Program and began meeting regularly with our registered dietitian. Over the course of two years, he lost more than 150 pounds! At his new healthy weight, he was able to secure a retail job. Last year, his mother was diagnosed with cancer and during that stressful time, he was able to receive rent and utility assistance from BEAM. This ensured that he and his mother could remain in their apartment as she began treatment. Because he was healthy and able to maintain his job, he was in a much better position to support his mom through her health challenges. We hear she is doing well and on the steady path to recovery. We’d like to show our appreciation to longtime Client Services Manager Kathy Maloney for her 14.5 years of dedicated service to BEAM, our clients and the beaches community. She began her retirement in January 2019 and is looking forward to spending quality time with her family and grandbabies. BEAM’s recent partnership with the Brooks College of Health at the University of North Florida has brought some changes to our Mayport and Jax Beach food pantries! With the help of one of our UNF nursing students, Rebecca Cheney, and as a part of our “client choice” initiative, we have incorporated a “Healthy Choice” option throughout the pantries that helps clients easily shop for healthier options. Statistics show that one in three food pantry client households include an individual with diabetes and 58 percent include an individual with high blood pressure. Our new “Healthy Choice” alternatives address these statistics by incorporating labeled shelves with low sodium, low sugar, whole grain or whole wheat foods into each client’s shopping experience. The “Healthy Choice” categories chosen for our food pantries are approved by our full-time Registered Dietitian and are proven to have health benefits. Our student partner was the winner of an Osprey Community Engagement Medallion for demonstrating exemplary commitment to the community through her project! Congratulations Rebecca and thank you for making it easy for our clients to choose healthier options at our “client choice” food pantries! Rebecca Cheney receiving a medallion for her Healthy Choice food labeling system project at the University of North Florida's Osprey Community Engagement Medallion Awards Ceremony. BEAM’s Food and Financial Assistance Services aim to prevent Beaches residents in emergency situations from going hungry and avoiding eviction or homelessness. Karen is the grandmother and caretaker of her 12-year-old grandson. She had previously worked with Client Services Manager Kathy Maloney for rent assistance, but most recently came to BEAM for help at the end of last year when she welcomed another newborn grandchild into her home. Kathy was able to identify Karen’s needs and provided her with diapers and other essential baby items from the food pantry. She also reached out to mothers in the community who gathered items together to provide her with a crib, car seat, and other newborn baby supplies. As my six month mark approaches (which is hard to believe! ), I reflect on my time here and am still in awe of the incredible community support we receive. BEAM is truly something special and it is because of each of you. As you may know, our mission is to provide emergency assistance and a path to economic stability. them a trusted place to work closely with an IRS-certified volunteer who is trained to maximize their return. I am proud to report that this year, RealSense volunteers completed more than 260 returns at BEAM saving taxpayers over $50,000 in preparation fees. In addition, the tax refunds from those returns totaled over $300,000 (with $115,000 as a result of Earned Income Tax Credit credits)! What an incredible way to provide financial relief to families living paycheck to paycheck. I am also excited to share that in an effort to be more accessible to our hungry neighbors, we are beginning to pilot Saturday food pantry hours at both our Mayport and Jacksonville Beach locations. We will be open the first and third Saturdays in Mayport from 10 am – 2 pm and the second and fourth Saturdays from 10 am – 2 pm. Should you have an interest in volunteering on a Saturday, please let us know! 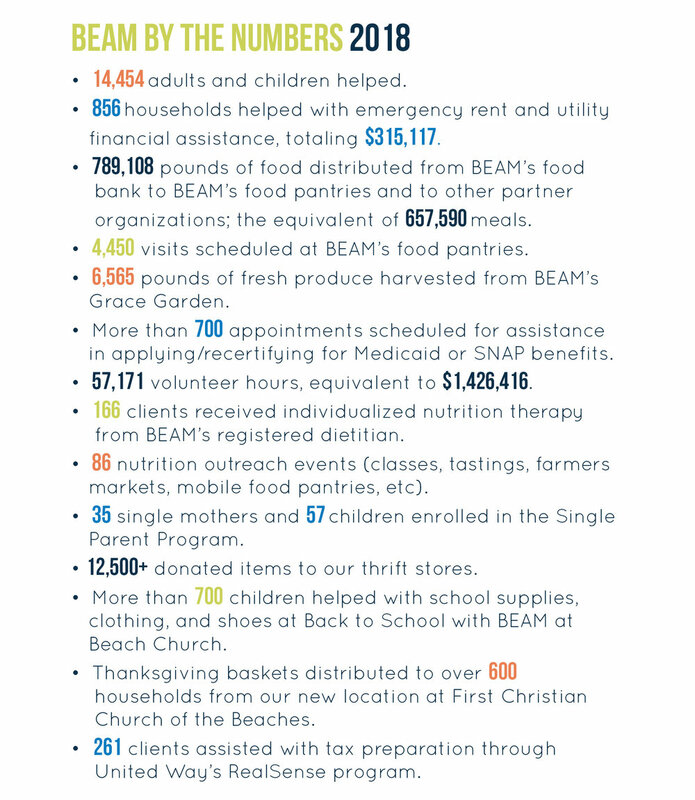 Thank you for the many ways you support BEAM and our beaches community. Beginning in 2014, we incorporated a full-time Registered Dietitian on staff to work alongside our clients and to provide nutrition education to the community. The Paths to Wellness program has three main goals: to provide prescriptive guidance to those with nutrition-related diseases (such as diabetes or hypertension), to provide preventative education to those who are at risk and to facilitate direct outreach to the community through mobile food pantries and community events. Biweekly one on one case management support with 61 individual clients and our Registered Dietitian to learn how to incorporate dietary changes resulting in better health outcomes. A new partnership with the YMCA to spearhead a yearlong Diabetes Prevention Program. Food tastings and nutrition education at BEAM’s new mobile food pantry at Mayport Elementary School each early release school day. 20 University of North Florida Department of Nutrition and Dietetics students worked closely with our dietitian to provide evidence-based education to food pantry clients. Started in 2014, the Single Parent Program was a strategy designed to assist one of BEAM’s largest demographics, single mothers. By providing one on one case management and wraparound services, BEAM developed this program to intentionally work with single mothers in the beaches community to lead them to a life of self sufficiency. Program participants agree to meet on a weekly basis for intensive workshops to provide them with the tools they need to increase credit scores, manage debt, develop career goals and work towards advanced schooling opportunities. In 2017, we celebrated a milestone for the SingleParent Program and more importantly for Nekia, a three year program participant who graduated with a Surgical Technology Workforce Certificate from Florida State College at Jacksonville. She was one of the first in her class to land a job working for a local healthcare system increasing her salary 60%. To date, we have had 36 single parents and 113 children participate in the program to gain self sufficiency. A large part of BEAM’s work in our community is to assist hardworking families by providing rent and utility assistance when times are tough and budgets are strained. In 2017, we were able to assist more than 800 families by keeping them in their homes and their children safe. In addition, one of our busiest times during the year was post Hurricane Irma and the devastation it caused for many. With support from the First Coast Relief Fund and our donors, we were able to provide additional financial resources to those who were impacted by the storm. We aided 92 families affected by the storm with rent or utility help for reasons such as lost wages, damage to their homes, or unplanned evacuation expenses. Eddie, a father of two, came to BEAM looking for assistance. It had been an emotional few months for his family as he and his wife found out their second child was diagnosed with a rare cardiac condition requiring open heart surgery at just 4 weeks old. Eddie was forced to take a leave of absence from his civilian position with the Navy to focus on his family. Before he knew it, bills piled up and he was three months behind on his rent, his car insurance had lapsed and his phone had been cut off. 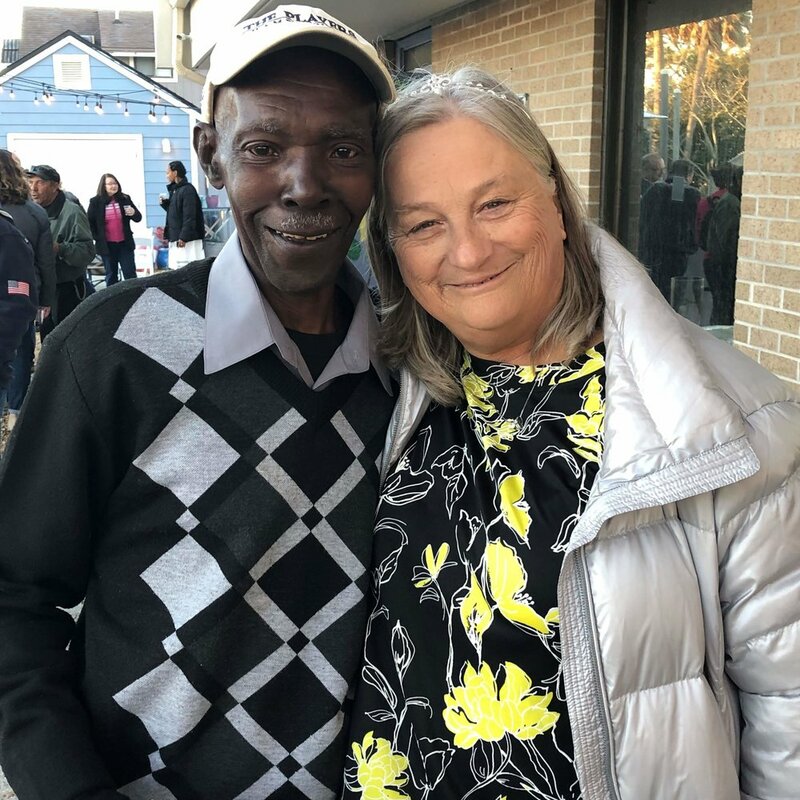 BEAM was able to provide Eddie with rent assistance and a few referrals to local partners that helped meet his other financial needs. Eddie was able to catch up on his bills, go back at work, and we hear his baby boy is doing great!